The Series 616WL Differential Pressure Transmitter senses very low pressures of air and non-combustible, compatible gases and sends a standard 4-20 mA output signal. All models, including those featuring the 3 digit LCD digital read-out, are factory calibrated to specific ranges as listed in the chart below. Positive, negative and differential pressures can be measured within a full span accuracy of ±0.50%. This weatherproof unit is enclosed in a polycarbonate case, designed to meet (IP66/NEMA 4X). Internal digital push button zero and span allow for quick and simple field calibration. Accuracy: ±0.50% F.S., display accuracy ±0.5%. Thermal Effect: ±0.02% F.S./°F (0.036% F.S./°C). Power Requirements: 12-30 VDC (2-wire). Zero and Span Adjustments: Digital, Push Button Adj. Loop Resistance: DC; 0-900 ohms maximum. Process Connections: Barbed, dual size to fit 1/8" and 3/16" (3.12 and 4.76 mm) I.D. rubber or vinyl tubing. Weight: Without LCD 17 oz (482 g); with LCD 18 oz (510 g). 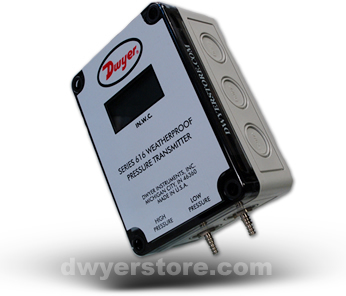 EXAMPLE 616WL 1 AT Series 616WL-1-AT Differential Pressure Transmitter, range 0-0.10" w.c., with aluminum tag.